Now you might be forgiven for thinking this is not much of a story, but it is one of those little insights into the development of Chorlton. The north end of the township had undergone pretty rapid development from 1880 onwards, so much so that the area which had once been known as Martledge quickly just became New Chorlton or the New Village. 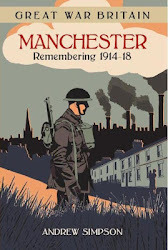 But the old centre of Chorlton around the green and running up Beech Road was slower to be developed and there remained plenty of open patches. But such was the demand for housing that these too began to be built over. In 1915 the six terraced houses facing the Rec on Beech Road went up, followed a little later by the parade of shops running from Wilton down to the chip shop and newsagents. 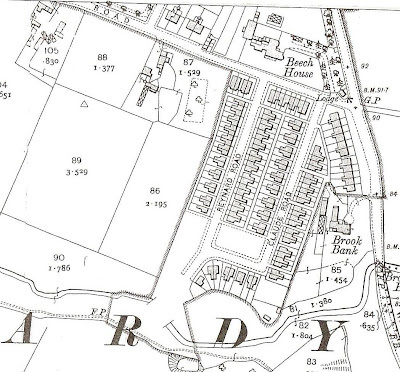 And a decade earlier the pocket behind Beech Road down to the Brook was laid out and built on. 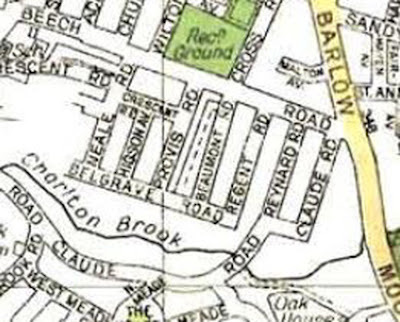 Provis, Neal and Higson date from around 1910, and some of Beaumont a by the 1924.*. Most were built by Joe Scott whose building enterprise made certain that when his wife, Mary Ann looked out of their back bedroom window what had once been fields all the way down to the Brook was now houses.